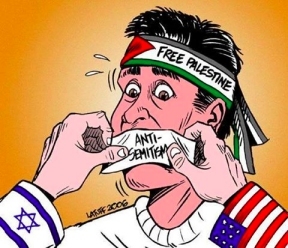 The Israel Lobby tries to stop freedom of speech in Hastings. 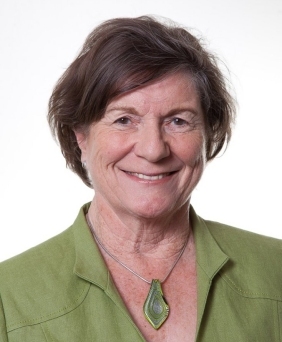 Meeting with Dr. Jenny Tonge: The Reality of Everyday Life in Apartheid Israel. Thursday 24 January. 7 - 9pm. Unfortunately, we've had to move the venue of this meeting after a series of threats and attacks by the Israel lobby directed at the venue, the White Rock Hotel. Starting Christmas Day, continuing into Boxing Day, there was a concerted online assault directed at the venue. The young receptionist on duty started receiving abusive 'phone calls. This was accompanied by unpleasant Facebook messages. An online petition was set up calling for the cancellation of the meeting; this included language that was no doubt libellous. On top of this, there was a concerted effort to post negative online reviews, knocking the hotel's Facebook star rating down to 2.6. Many of these comments were full of hate and abuse. This attack was obviously designed to do damage to the business. Out of respect to the business and the proprietor, a mutual decision was made to find another meeting place. The proprietor is a highly respected local businessman who has done a lot for the local community. He is a firm believer in freedom of speech. Many local community groups use the White Rock Hotel for meetings, groups such as women's groups, environmental groups. As the news of this attack is getting out, there has been growing resentment, even anger, directed at the perpetrators. It is being seen as an attack against the local community. An analysis of the Facebook review campaign shows that there were no posts locally, none from Sussex or Kent. Most were from abroad. 18% were from Israel. What right do people from Tel Aviv, Haifa, New York, Washington have to tell the people of Hastings what to do? We're finding that there is a growing backlash against the Israel lobby because of this. We will announce the new venue in due course - we'll send out a newsletter nearer the time. With the increasing publicity surrounding this attack, it looks like the meeting with Dr. Jenny Tonge will get a really good turnout. So we look forward to a successful meeting! Her insights come from regular trips to Palestine/Israel where she has seen first hand the daily indignities of the Israeli apartheid state. HSBC divests from Israeli drone manufacturer. HSBC has confirmed that it has fully divested from Israeli drone manufacturer Elbit Systems, which sells weapons to the Israeli military used in attacks on Palestinians. This excellent news shows that grass-roots pressure works. Banking giant HSBC divests from Israeli arms manufacturer. More positive news: Young musicians in Gaza fight the siege to play for peace. Gaza's only mobile theatre tours children's hospitals. Four-year-old Palestinian boy dies of wounds from Israeli fire. Medical Aid for Palestinians (MAP): The UK must address attacks on Palestinian health workers in Gaza. Israel spraying herbicides inside Gaza. Video: Christmas under occupation for Christians in Gaza. Israel Tampered With Video of Strike That Killed Two Palestinian Boys. PSC wins permission to appeal to the Supreme court. 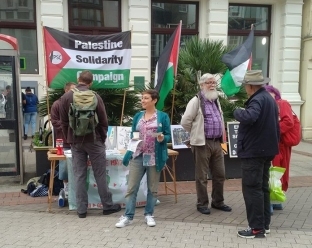 In 2017 PSC won a victory in the High Court that stopped the government from introducing regulations that would prevent local government pension schemes from divesting from companies complicit in Israel's occupation. In 2018 the Court of appeal overturned that judgement. Having raised sufficient money, the PSC sought permission to appeal to the Supreme Court to overturn the decision. We've now succeeded in this. If we win the case, this will be a major victory against the the government's attempt to dictate to local councils. Article here. Donations are needed for PSC's legal costs. Thanks to everyone who supported our campaign and to everyone who sent in photos of Israeli apartheid produce sold in local supermarkets. We highlighted these on our Facebook page and at the weekly information stall. 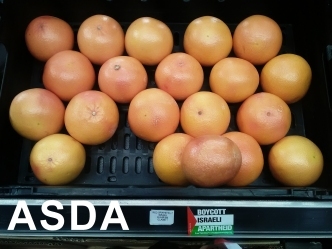 We found Israeli products at: Asda (Hastings) grapefruit; Marks & Spencer (Hastings) dates; Morrisons (Hastings) dates and grapefruit; Jempsons (Rye) dates. Israel demolished 538 homes, facilities in West Bank in 2018. These demolitions have left 1,300 Palestinian adults and 225 children homeless. Article here. It has been estimated that Israel has demolished 48,743 Palestinian buildings in the occupied territories since 1967. Source. 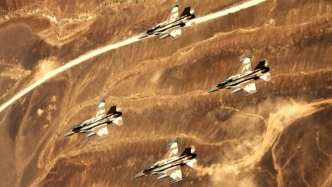 Israeli military put Lebanese and Syrian civilians at risk in air strikes. Israeli military put Lebanese and Syrian civilians at risk in air strikes which 'could have caused a major civil aviation disaster.' Israel has been bombing targets in Syria for 6 years. This bombing is totally illegal under international law. Israel has never attacked al-Qaida or Daesh (Islamic State) positions. In fact there is increasing evidence that Israel has supported a number of the armed groups in Syria, these include the Nusra Front, usually described as al-Qaeda in Syria. Israel lobby orders the Australian national football team not to play against the Palestine team. Hard to believe the arrogance of these people: article here. Includes a short video with Roger Waters (Pink Floyd). We run fortnightly stalls on the cobbles at the top of Conduit Hill, where it meets the High Street. 11 - 1 pm. The next date is 19 January.